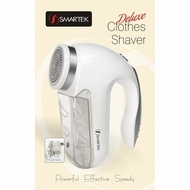 SmarTek Deluxe Clothes Shaver safely and efficiently removes pills, lint, and fuzz from clothing, upholstery, drapes, blankets and more. This fabric shaver safely trims only the top fuzz and suctions it neatly into a detachable bin thereby eliminating pills, lint, and fuzz from wool, cottons, knits, and synthetics without damaging the fabric. It features a large 2-1/2-inch shaving surface; a comfort grip handle; very low power consumption; a removable fuzz bin; can be used with power cord or cordless (requires 4 C batteries-not included). This package contains one Fabric Shaver (7 by 3 by 5-1/2-inch); one power cord (UL Listed E229288) 120C AC and 6-Volt DC; and one cleaning brush. Imported.